Wait a minute – is there something more terrifying than trying to cut a baby’s nails? If you’re a first-time-mum, the idea of trimming those delicate fingernails may sound nerve-wracking. But do things always have to be that way? Well, as it turns out, grooming should be a friendlier experience provided you use the best baby nail clippers. But what sets the top choices ahead of the rest? Let’s walk you through all the tiny bits to consider in this detailed review. Whether you’re looking for clippers that won’t nip the baby’s fingers or balanced hoops for convenience, the following 9 reviews have all the details you need. What’s more? We’ve included a detailed buying guide along with a verdict on which baby nail clipper to buy. One thing that stands out about this clipper is the fact that it comes with a magnifier which makes it easy to take a closer look as you trim. This can be of great benefit to anyone who might be nervous. However, some people have reported that this magnifier might be unnecessary. Of course, the question of its importance boils down to your confidence and experience. Besides the magnifier, this cute little clipper is expertly designed for tiny nails. It has rounded edges and teeth which are just sharp enough to do the job. And besides that, its grip is made from high-quality plastic which makes it pretty easy to handle. Its blades are made from stainless steel blades for enhanced durability. 4X zoom magnifying glass to reduce eyestrain. The magnifier might be an unnecessary addition to some. Trimming your baby’s nails doesn’t always have to be bothersome. However, if you make the mistake of neglecting them, they can easily lead to self-inflicted injuries. That doesn’t have to be the case if you’re using the Zoli Buzz trimmer, though. The product is highly effective in cutting nails in a safe and hygienic manner. What’s more? The trimmer is pretty easy to use all thanks to the fact that it uses oscillation power to do the job. This leaves you with the freedom to focus on delivering smooth and professional nail cuts. Best of all, this unit comes as a complete package. In it, you’ll find four cushioned pads designed to suit your baby’s needs as they mature. The nails get trimmed and filed at the same time. It is a perfect baby shower gift. It is a bit slower than regular nail clipping. Are you struggling to maintain your tiny baby’s nails? 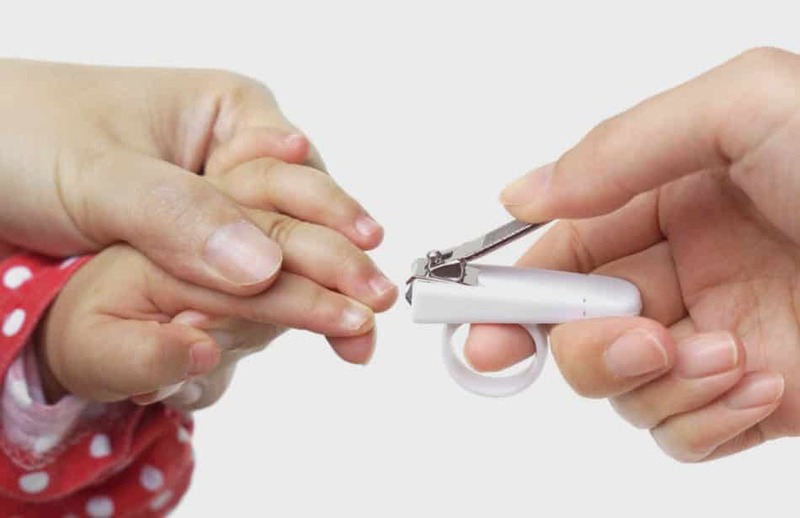 Fridababy Baby SnipperClipper Trimming set is designed with many features ideal for clipping the nails of newborns and toddlers. It has a safety hole that you can use to double check the trimming process. This helps reduce the risk of injury, especially on extra-sensitive toes and fingers. The blades are curved and overlap for effective trimming. This makes it easy to deliver smooth cuts and get rid of rough edges as well. A unique feature of this trimming set is that it comes with an S-Shaped nail file which is ideal for trimming those tiny fingers. They are silent with no clip noise. Baby designed nail file included. You need to be careful and use the spy hole to avoid injuring your baby. You don’t want to hurt your baby’s little nails with a regular nail clipper. Little Martin’s Electric Baby Nail Trimmer Clippers are excellent for maintaining tiny nails because they trim by filing nails. There is, therefore, minimal risk of injuring your baby. The clipper is light in weight and easy to operate. Also, it runs silently, and you can use it to trim your baby’ nails even when they’re asleep. What’s more, this kit has an LED light for illuminating your baby’s nails. It is powered by two AA batteries. On top of that, it has multiple settings for controlling the speed and rotation patterns. The package also includes three attachments for adult use and three cushioned sandpapers designed for babies and kids. They operate silently without a noise. The trimmer can also be used by other family members. The Clippers are more expensive than conventional clippers. Battery operated, therefore, requiring replacement. The sandpaper will need replacement when they run out. From birth onwards, you need to trim your baby’s nails at least once a week. This is important in preventing them from accidentally scratching or even injuring their faces. At the same time, though, babies are naturally soft and delicate and so you want to be careful while trimming. Given the fact that nails grow so fast, the PiyoPiyo clippers are meant to help you end the dilemma. Indeed, these tiny scissors are designed just for the little ones. Their blades are just sharp enough to accomplish the job yet carefully designed for optimal safety. For instance, the clippers feature curved blades which go a long way in ensuring your little angel remains safe during the trimming. No chance of nicks during trimming. Ideal only when the nails are still soft. The Sleepy 49009 nail trimmers are in a class of their own. Yet even though they’re designed for extremely delicate fingers, they tend to do an incredible job (we actually found it too soft for kids aged 3 months and above). First off, the trimmer is battery-powered. That means no manual energy is needed to do the clipping. Also, this unit is designed to operate quietly and so you need not worry about waking up your baby. As you probably are aware, it’s always best to clip their nails when they’re asleep to reduce any resistance. In addition to that, this unit comes with an LED light which helps illuminate the area under focus. That’s of course in addition to an ergonomic handle as well as a curved blade which present a variety of safety features. Last but not least, this unit comes as a package. Within it, you’ll find a package comprising an emery board which is ideal for filing nails. Emery board and slot for filing the nails. Only designed for extremely soft nails. Pigeon’s Baby Clear Cut Nail Trimmer Clipper is a product of Pigeon, a Japanese company. The company has an attractive track-record of producing award-winning trimmers. Indeed, even this trimmer has attracted a long list of positive reviews since its launch. A closer look at it reveals that it uses flat blades. This is crucial in providing a good view of the nails as you trim them. Its body is made of steel. But why steel? Well, steel is quite durable and strong and, therefore, ideal for long-term use. And to make sure the clipper has a great grip, it’s handle is ergonomically designed with a non-slip feature. Once you order this, you should also expect to receive a free blade cover. Blade cover for storing the clippers. You need to be observant when trimming to avoid nicks. Using regular nail clippers makes maintaining a baby’s nails cumbersome and risky. Fortunately, the Simba P1737 trimmer boasts quite a variety of awesome features. First off, the scissors are pretty small and, therefore, excellent for handling tiny nails. Secondly, the tips are round in shape to prevent to conform to the natural shape of nails. Worth noting, however, is that these clippers are recommended for kids who are three months and above. So, you may want to avoid them if you’re looking for newborn trimmers. Safe because of the rounded tip. They are easy to use and they trim fast. The NCPL148 may not have all the bells and whistles but is sure provides you with all the features needed for trimming little kids’ nails. The first, awesome feature of this clipper is that its handle is made from natural bamboo. This is a non-slip material which is also comfortable and convenient to handle for long hours. As if that isn’t enough, you end up with blades that are pretty sharp. That’s all you need to provide a smooth finish to each trim you make. And the icing on the cake – this clipper is pretty cute! The design is unique and takes a little bit of time to get used to. Careful handling is required to avoid nicks. Whether your bundle of joy has just arrived or you’re expecting them in a few months’ time, getting the right nail clippers is recommended. Babies’ nails tend to grow quite fast. What’s more? They also tend to be extra sensitive to cuts. That means it’s quite easy to harm your baby even without knowing it. The secret is to find a clipper that helps you avoid all these challenges. You may always choose between clippers and scissors. Clippers work just like nail cutters. Scissors, on the other hand, require a bit of care though they tend to operate quietly as well. The best choice here is always a matter of preference. So, just stick to whatever you’re comfortable with. The blade is the part of the trimmer clipper that actually comes in contact with your baby’s nails. You don’t want to compromise on this part at all. Ideally, you should go for a stainless steel blade. This should be designed in a rounded and ergonomic fashion so it snugly fits around your kid’s nails. Eventually, that would make the trimming job way easier and safer for you. Most clippers either have their bodies made from stainless steel or plastic. Plastic bodies tend to be easier to manage and are baby-friendly as well. However, they’re not durable, unlike the stainless steel ones. However, unless you’re using your clipper ruggedly, there’s no reason to worry. Just be sure to find a unit with a soft and baby-friendly design. A magnifying glass is an optional addition. You might need it if this is your first time trimming a kid. However, if you’re a guru, this might not be really that necessary. All you’d need to keep in mind is that magnifying glasses are purely meant to improve your vision so you can deliver accurate cuts. These may come in handy when trimming newborns. Having considered all the features, facts, and opinions listed above, our opinion is that the First Years American Red Cross Clipper is the best pick. It is well-designed, plus it comes with a handy magnifying glass. Its blades are also quite durable and its handle is ergonomically designed. It, however, is exclusively available in the US market. So, there you have it – a full list of the top baby nail clippers. As you can see, each one of them comes with its list of merits and demerits. So, all you need to do is think about your specific needs. Once you have figured out how much you want to spend and the additional features you need, the rest of the process should be pretty straight-forward.